Program Oral Interpretation is a 10-minute performance that can include some combination of Prose, Poetry, and Drama. All students must have at least two out of the three genres included in their performance. The use of a manuscript is required. The focus of the event is development of a theme or argument through the use of narrative, story, and/or characterization. When judging all interpretation events, it is helpful to keep the Dramatic Structure in mind. Exposition sets the scene and gives background information. Exposition occurs throughout the cutting and enhances the audience’s understanding of what the characters in the program are experiencing. The Inciting Incident sets a conflict into motion and represents the beginning of the Rising Action, which complicates the plot. 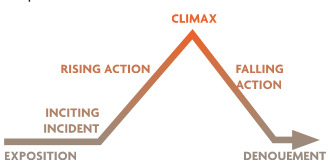 The Climax is the point of greatest intensity and the turning point of the plot. Falling Action resolves the conflict and Denouement gives a glimpse of life after the conflict. There are three key areas of a POI that come together to create the performance the judge will evaluate. First, programming, or the process of piecing together different types of literature into one cohesive performance. The program should create a compelling performance centered around a theme or idea. Second, blocking, or the movements a performer makes to convey space, emotion, and action. Blocking should enhance the performance, not distract from the story. Movements should be motivated by either internal or external factors. Internal motivation stems from how the character is feeling, while external motivation comes from a physical reaction to external factors. In POI, the student is allowed to use the manuscript as a prop to enhance blocking as long as they maintain control of the manuscript at all times. Third, characterization: characterization reveals the personality of the character through line delivery, vocal, and facial expression, and varying levels of levity and intensity. Each piece of literature in a student’s POI should have unique and engaging characters that can be distinguished from other pieces in the program. Additionally, each character should adequately represent the genre of literature from which they are drawn. The student should display command of poetic delivery when performing a selection of poetry, for example. Each performance has a 10-minute time limit with a 30-second grace period. If a performance exceeds the grace period, the student cannot be ranked first. There is no other prescribed penalty. The judge also will write comments to the performers on the ballot addressing different areas of the performance. When critiquing a program, judges ought to reference areas of the Dramatic Structure that were strong or weak and suggest ways in which the student can improve upon the cutting, in addition to focusing on how the student’s selections of literature fit with each other. Judges should consider if they could easily identify which selection the student was performing. If the performer’s blocking is ineffective, the judge ought to indicate ways the performer can improve on the ballot. Critiquing characterization requires the judge to consider whether the character’s response to a situation is believable. The ultimate goal of blocking, programming, and characterization is to create a fullyrealized performance that moves the audience. The performer who combines these three factors the best should receive the one ranking.